What Are Benefits of Juicing Sweet Potatoes? Many people enjoy vegetable juices as part of their meal plan, although cabbage is a less-common option. You can juice cabbage leaves or drink the juice that comes from sauerkraut; both offer benefits. Consult your health care provider before drinking cabbage juice to treat a medical condition. Adding cabbage juice to your meal plan may be a good choice if you have cancer or face a high risk of developing cancer. Research published in the March 2011 issue of "The British Journal of Nutrition" looked at the effects of cabbage juice and sauerkraut juice -- or fermented cabbage -- on rat livers. The study indicated a chemoprotective influence on the liver. Laboratory studies also showed promising results on human breast cancer cells, as evidenced in a study featured in the June 2005 "Journal of Nutrition." Human trials are required to confirm both of these findings in men and women. Millions of Americans contract foodborne illnesses each year, and some of these illnesses derive from bacteria. 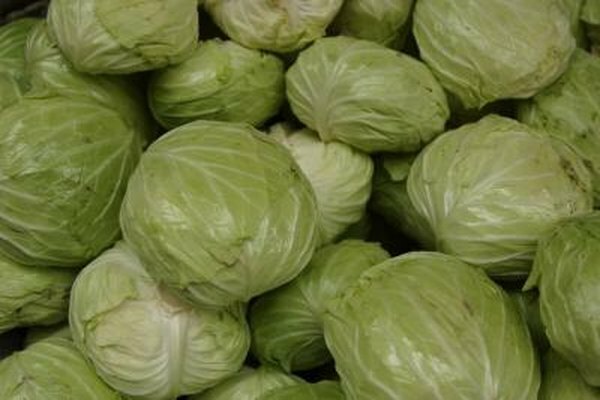 Drinking cabbage juice may help prevent foodborne bacterial sicknesses. Evidence available in the September 2006 issue of the "Journal of Food Protection" notes that juice from the Brassica oleracea leaf, a type of cabbage, inhibited the growth of bacteria, including E. coli, and Listeria monocytogenes. Researchers theorize that this juice may play a role in preventing bacterial growth. If you suffer from yeast infections, consider incorporating cabbage juice into your meal plan. A study published in the July 2003 issue of the journal "Fitoterapia" investigated the efficacy of cabbage juice against Candida albicans and other pathogenic fungi. Researchers discovered that this juice inhibited the reproduction and appearance of Candida albicans, the fungus responsible for most yeast infections in the human body. Cabbage juice inhibited the growth of other fungi as well. Consult with your health care provider before treating yeast infections with cabbage juice. Up to 50 million Americans suffer from lactose intolerance, according to KidsHealth. Cabbage juice produced by lactic acid bacteria becomes a probiotic beverage. Researchers theorize this makes a healthy option for those with lactose intolerance. Probiotics may be an option for dealing with lactose intolerance as they may aid the body in digesting lactose; however, more research must be conducted to prove that they are effective when used for this purpose. What Are the Benefits of Tart Cherry Juice?